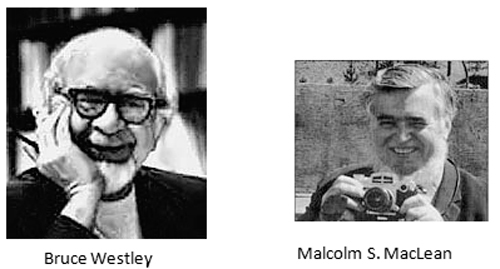 In 1957 Westley and MacLean’s model of communication is proposed by Bruce Westley (1915-1990) and Malcolm S. MacLean Jr (1913-2001). Being one of the creators of journalism studies, Westley served as a teacher at the University of Wisconsin, Madison, between 1946 and 1968. Malcolm was director of University of Journalism School (1967-74) and co founder of the University College at University of Minnesota. Westely and Maclean realized that communication does not begin when one person starts to talk, but rather when a person responds selectively to his/her physical surroundings. This model considers a strong relation between responds from surroundings and the process of communication. Communication begins only when a person receives message from surroundings. Each receiver responds to the message they received based on their object of orientation. A Daily News Papers will receive many Press releases from Many Public Relations Agencies on behalf of their clients. In this case, News paper will publish the selected Press release due to the space constraints. Then, Readers can directly respond to the client or they can respond to the News daily which published in the Newspaper. If Readers responded to daily News paper, it will communicate the feedback to concern PR Agency. 3. Feedback loop between Reader (B) and Client (A)- fBA. This model accounts for Feedback. It can account for different modes of communication, i.e., for both interpersonal communication and Mass communication. It is a predictive model of communication and very descriptive also. It also account for non binary interactions, this means that it will remain good even for communications involving more than two sources. 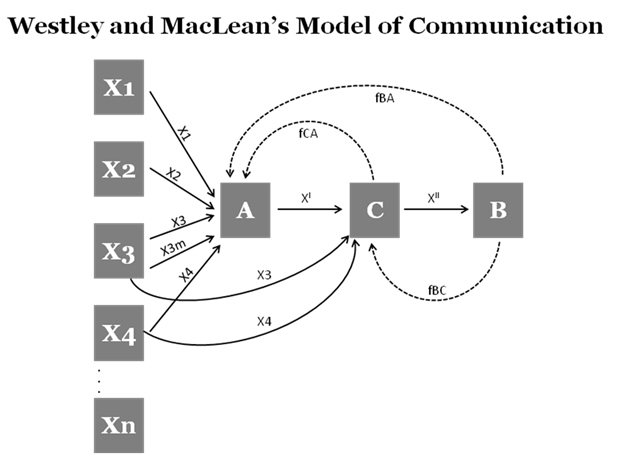 Westley and Maclean communication model is Two Dimensional. It cannot account for multi dimensions; this means this model will not be applicable for typical communication events that involve broader context and wide range of communication messages. This is wonderful keep it up sir. Many thanks. I’m very happy… This could be the best of all the report I can givecheers! This is a typical mass communication model that explores it to it simplest terms. It elaborate s the link that exist between the mass and the media. This is wau! A self-communicative and explanatory model of communication. Well done Sir. Awesome! Thanks a lot. Helped for my exams. YES! !Communication indeed does not happen with one person. is (A) a client? or a Reporter or observer?..I got confused about A. please I need an explanation..
Nice one & informative as well. Everything has beem discussed in the easiest way. Recently i read a communication models book.i gained nothing.but when i read this one.i understood the whole model.because it is very simple easy to understand and to the point.thanks whovere wrote this.